If exploring outdoors is your passion, Renault India has an all new limited edition SUV for you. 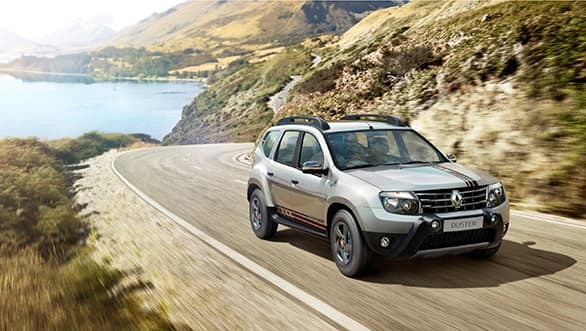 Called Renault Duster Explore, this sports utility vehicle has been designed to appear really bold and adventurous and let the rider conquer tough terrains. 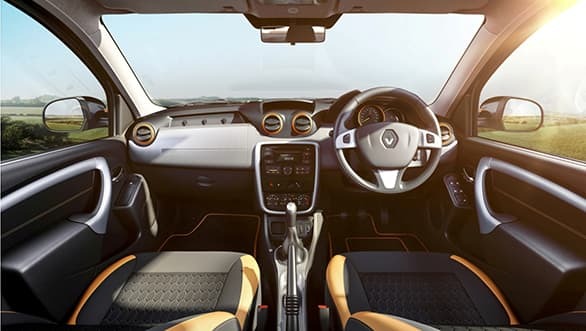 Renault loves its Limited Edition variants and last year, we saw the Renault Duster Limited Edition being launched in the celebration of 1 lakh car sales. This tine around, the Duster Explore is all set to strike a chord with the audience by introducing sporty exteriors and a refined 1.5 litre dCi engine. Let's find out all the olds and news about the Limited Edition Duster Explore. One look at the car will tell you that it has the robust appeal with a fresh new appearance. There's an all new dark chrome front grille, racing stripes throughout and a skid plate. The front armour comes with sharp lamps whereas the tailgate comes with dark chrome finisher having ‘Duster’ engraved on it. Another feature to catch your eye are the wide anthracite alloy wheels coming with a new ‘Nouveau Orange’ highlight in the centre. Overall, the design speaks highly about the SUV's spirit of adventure & dominance. The company believes that the SUV will appeal to families who love their weekend getaways as well as to those who are diligent about commuting daily to office with panache. There are two variants of the Limited Edition Duster Explore - Duster 85 PS RXL Explore priced at Rs. 9.99 Lakh and Duster 110 PS RXL priced at Rs. 11.10 Lakh (ex-showroom Delhi). The powerful 110 PS version has a 6 speed manual transmission and comes with a fuel efficiency of 19.64 kmpl (ARAI). The 85 PS version features a 5-speed manual transmission and is said to deliver best-in-class fuel efficiency of 19.87 kmpl (ARAI). Coming to the interiors, in here too the ‘Nouveau Orange’ is the major highlight. From the seat fabric upholstery to the door trims to the gear shift, chrome knob, leather steering wheel and AC vents, the orange shade been abundantly used. Among other features - the Duster Explore boasts of the gearshift indicator, cruise control, speed limited as well as the Eco mode. It goes without saying that the Duster Explore is pitted against the likes of Hyundai Creta and Maruti Suzuki S-Cross. The company is also poised to launch the new 2016 Duster at the upcoming Auto Expo in Delhi. Till then, let us know your thoughts on the Limited Edition Duster Explore via comments below.